HARRISBURG, Pennsylvania, Nov. 9, 2018 /PRNewswire/ -- TE Connectivity (TE), a world leader in connectivity and sensors, today introduces its new ERFV RF coax connectors for 5G wireless applications. The new solutions will be showcased in an active antenna display at TE's booth (Hall 82, Booth 225) at the Electronica show next week in Munich, Germany. TE Connectivity's EFRV coax connectors enable next-generation 5G wireless board-to-board and board-to filter designs at a lower cost. Future 5G wireless equipment designs will require a new level of highly reliable and customizable components, offered at lower costs that can enable the expanding worldwide wireless infrastructure. TE's new ERFV RF coax connectors support next-generation 5G wireless designs by implementing antenna and radio board-to-board and board-to-filter connections at a lower cost. ERFV coax connectors use a cost-efficient one-piece design and offer a high degree of customization with a range of between-board heights and connector configurations. 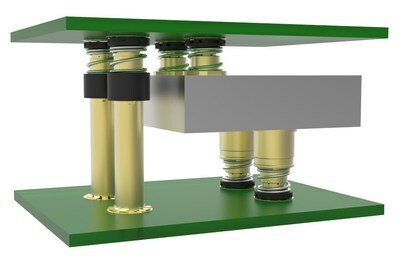 With ERFV connectors, between-board heights can range from 5.2mm to 20mm depending on product applications such as board-to-filter or between printed circuit boards (PCBs). The connector can also be applied as a surface mount board-to-board connection or a screw-in or push-in connection into filters. In addition, ERFV coax connectors deliver proven reliability with axial misalignment tolerance of +/- 1mm, radial misalignment tolerance of +/- 0.8mm, and outstanding insertion loss and return loss over DC to 10 GHz. "To address the needs of our customers designing wireless and telecommunication applications in preparation for the impending rollout of 5G, we have developed an innovative one-piece RF connector design," said Erin Byrne, Vice President Engineering and Chief Technology Officer of the Data and Devices business unit at TE Connectivity. "This one-piece solution offers a significant cost savings over three-piece solutions while still maintaining excellent performance standards." "Designers creating the new generation of 5G wireless solutions need connectivity products that offer high performance and a high degree of flexibility, all at lower costs," said Eric Himelright, Vice President of product management of the Data and Devices business unit at TE Connectivity. "We are at the cutting edge of enabling new, customized 5G wireless board-to-board and board-to filter designs with our new cost-efficient ERFV one-piece RF connector solution." To learn more about TE's new ERFV coax connectors, click here. TE Connectivity, TE, TE connectivity (logo) and EVERY CONNECTION COUNTS are trademarks owned or licensed by the TE Connectivity Ltd. family of companies. Other products, logos, and/or company names mentioned herein may be trademarks of their respective owners.